My children are have a huge imagination, such that it becomes almost impossible not to turn into a kid myself when it comes to Halloween costumes. We plan all year what creative-most thrifty-unique transformation we can come up with, & then we work for months waitingr with great anticipation. Our inspiration almost always comes from Disney, but I honestly think that my boys must have such huge love for their mother – I mean they must love me tremendously to allow me to do with them as I please (to secretly fullfill some childhood desire of my own). Christopher is 10 yrs old & Jullyan is 6... & I fear the day that will come when this tradition we have will no longer be something we all do and enjoy. AWWWWWWWWWWWW! Super cute, and I love the costume! How did you do the braids on their chins? I made them out of yarn--the cheap kind from Walmart...thick brown and black. I braided some jist one color then some mixed. Love!!! 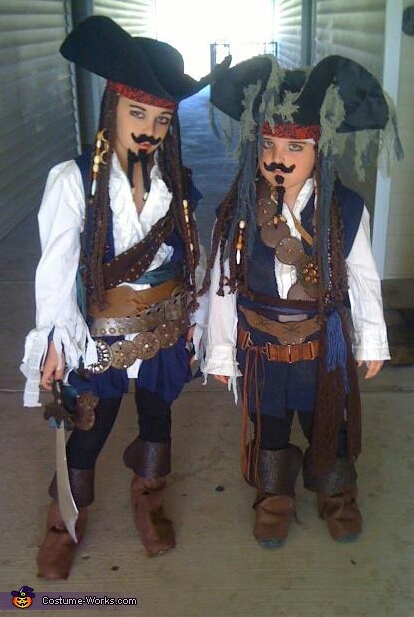 I'm going to attempt these for our boys to where at a pirate party on the Disney cruise!! How did you make their boots? Are the shoe covers? And how did you do the wigs? I'm so impressed!!! Hi I would like try to do these costume for my toddler boy and my older son. Is it any pictures his to make them? Do you mind sharing little details, where are the brown leather chest straps from? The blue top? Show covers? Did you make all of it? How?